How is the beauty of a city defined? Probably by its nature, art, architecture, people, etc. Some cities are famous for their remarkable architecture, some for picturesque nature, others for their admirable art samples. 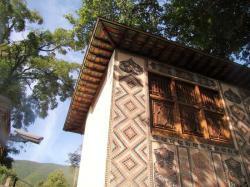 Whatever form of beauty speaks to you, there is no doubt that you will enjoy your time in Sheki. 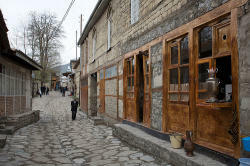 Nasib Imamaliyev, head of the Sheki Tourism Information Center, said that factors attracting foreign tourists in Sheki included the majority of historical monuments, the city’s ancient history, ancient art samples, urban flora and fauna, geographical location, cuisine (mainly sweets), hospitality, cheerfulness and sense of humor of Sheki people. Imamaliyev noted that in recent years there has been an increase in the number of tourists coming to the city. Until the end of the Soviet era, the number of tourists had been increasing dramatically. “Over the next 8-10 years it rose much more frequently and had still been growing,” he said. Imamaliyev noted that Sheki had been a transit zone from the Georgian border to Baku throughout the long history. He said that Sheki was a region, which tourists used as a place to stay for a couple of days and then continue their trip to or from Georgia, Baku and other regions. “The main reason for the development of the tourism sector and the increase of the number of tourists visiting Sheki is the fact that the region is stable. Tourists do not travel to places where there is no stability. In addition, the development and rising interest of foreigners in Azerbaijan, advertisements, increasing popularity of Azerbaijan in the world also contribute to this trend,” he noted. The inclusion of the city to UNESCO Creative Cities Network will lead to its further recognition and popularity around the world, Imamaliyev added. Earlier in November 2017 Sheki became a member of the UNESCO Creative Cities Network, an association supporting the formation of a network with the aim of promoting international cooperation between cities. 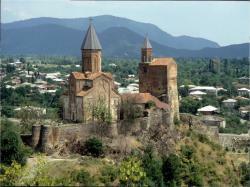 He noted that tourists from all over the world - Europe, Asia, and America - visit Sheki. Recently, however, there is an increase in the number of Arab tourists. 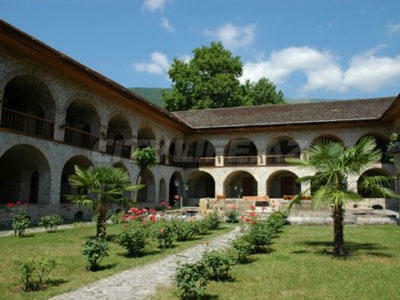 In general, tourists from 40 to 50 countries visit Sheki every year. 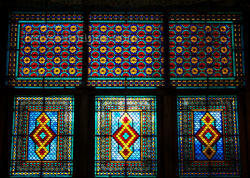 The most visited places in Sheki are Sheki Khan's Palace (“Yuxari Bash” Reserve), museums, Alban Temple in the village Kish, Shakikhanov’s House Museum, and Bazar, he said. Touching upon the interesting places to visit in Sheki, Imamaliyev said that there was a Labyrinth or the so-called “Eternal Silence World” (Əbədi Sükut Dünyası), a very ancient underground museum, which attracted the attention of foreign tourists. “Those who like horses can visit the center of horseback riding in Sheki,” he added. 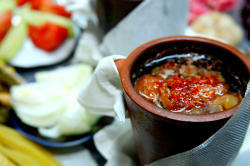 The head of the center noted that the most elite dish in Sheki is Piti. “It is almost a brand. I remember a time when I met a German tourist in the airport in Baku. He told me that he wanted to eat Piti in Sheki,” he said. 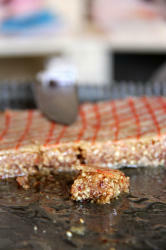 Imamaliyev said that the city was also famous for its sweets. “We always serve our tourists tea and Sheki halvasi or with rose water after the lunch or dinner,” he noted. Imamaliyev also touched upon the ancient history of Sheki. 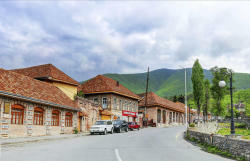 Sheki, located on the picturesque hillsides of the Caucasus Mountains, in the background of snowy peaks is one of the country's main tourist destinations, hosting more than 100,000 tourists every year. 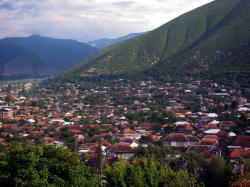 The city is a real natural wonder with its beautiful landscapes, mineral water springs, forests and rivers. Beautiful Sheki can also be called the architectural reserve of the country, since the city has 84 historical and cultural monuments. Archaeological findings suggest that the city might be one of the oldest settlements in the Caucasus. 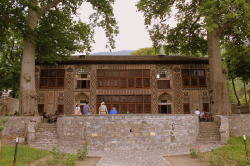 Modern Sheki was actually rebuilt in 1772 after the city was destroyed by mud streams - River Kish. 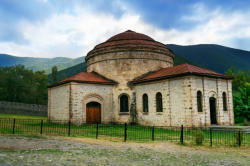 Annually, Sheki becomes a place for international and local festivals which attract many people.